"Rig ship for dive." The order to carry out the preparations for diving. "Ship rigged for dive," or "Ship rigged for dive except ........" A report indicating the accomplishment of the above order. "Clear the bridge." A usual preliminary to the diving signal. All personnel, unless excepted, lay below on the double. "Bleed air." An order to bleed air into the submarine. "Pressure in the boat." The report indicating that the hull is sealed. "Green board." The report meaning that all hull openings are shut, as indicated by the hull opening indicator panel, or Christmas Tree. "Six, (five, etc.) feet." An order to the diving officer, or the bow planesman, giving the desired depth. "Ease the bubble." "Zero bubble." "Five degrees down bubble." Orders to the stern planesman giving the angle desired on the ship. "Shut bow buoyancy vent." "Shut the main vents." "Open negative flood." Orders governing the operation of the various flood valves and main vents. "Vent safety." Open safety vent, then, after tank has vented, shut the vent. "Blow safety." "Blow negative." "Blow all main ballast." 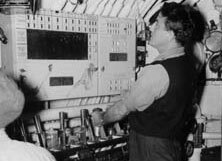 Orders to the air manifold watch to blow the designated tank or tanks. "Secure the air." "Secure the air to bow buoyancy." The order to stop blowing all tanks, or the designated tank. "Cycle the vents." Given when it is desired to vent safety, bow buoyancy, and the main ballast tanks in succession. "Full rise on the bow planes." "Five degrees dive on the stern planes." Orders to the planesmen, giving the angle desired on the diving planes. "Pump from forward trim to after trim." "Flood auxiliary from sea." "Blow from forward trim to sea." "Pump from auxiliary to after trim five hundred pounds." Orders to the trim and air manifold watches, used in shifting variable ballast. "Start the low-pressure blower, blow all main ballast." "Secure the air to number one." "Secure the low-pressure blower." Orders governing the operation of the low pressure blowers. "Pressure equalized." The report that the air pressure inside the submarine is the same as that of the atmosphere. "Take her down." Increase depth as rapidly as possible. Exact depth will be specified later. "Rig for surface." The order to place the ship in the normal peacetime surface cruising condition. "Open bulkhead flappers, and recirculate." Given after the dive has been made and conditions are satisfactory for recirculating ventilation air through the boat. "Low-pressure blower secured, all main ballast tanks dry, safety and negative flooded, conning tower hatch and main induction open, depth eighteen feet." A typical report by the diving officer, giving the conditions upon completion of surfacing.